The sallet was a common enough helmet after their rise during the middle of the 15th century, and for good reason. Helms like this Northern Italian Sallet Helmet were rather protective, while also lacking the drawbacks of many earlier great helmets. A typical sallet was a close-fitting helm that offered all the protection of a typical great helmet. This Sallet has simple styling and fits closely to the typical Italian-style sallet, possessing a relatively undecorated surface. Like most sallet helmets, this helm has a rounded top, while also featuring a rotating visor that allows for a knight or warrior to uncover their face when out of battle. The visor features stylishly cut and flared edges, as well as a vertical slit that allows a warrior to see out when wearing the helm. Unlike most great helmets, the sallets visor also helps with ventilation, which means the warriors who wear this helmet are less prone to overheating. 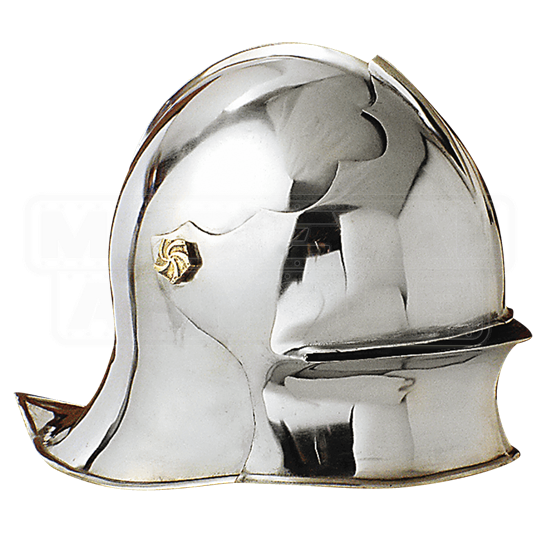 Secured just on the hinge of the visor is a simple decorative knob, which gives the sallet all the decoration it needs. Like most historical sallet helmets, this one also features a slightly swept back, which is upturned, to help provide a bit more defense to the back of the neck. This medieval helmet is made entirely from high quality steel, making it a great choice to wear or display. Whether you want to look like a real medieval warrior or if you just want a great new piece to add to your armor collection, this Northern Italian Sallet Helmet is a great choice, being perfect for both wearing and for display.